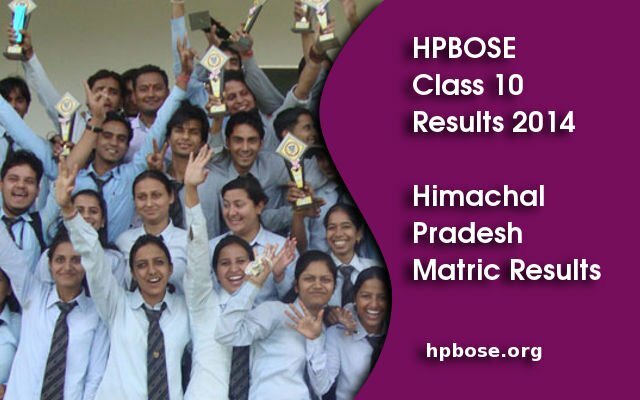 Himachal Pradesh Board 10th Class Results 2014 (HPBOSE Matric Results) is declared on 19th May 2014. Himachal Pradesh Board of School Education is released the results. Students who appeared for Class 10 exam in Himachal Pradesh state can check their results on the official website online. HPBOSE Matric Exam Results 2014 are available on the link Given below. Students Roll Number or Students name is required to check the class 10 results. HPBOSE Matric Exam 2014 was held from March 06 to March 20 with eight exam dates. The exams started with Mathematics paper. The Practical exams were held before the written exam from February 14 to March 01. In 2013 a total of 1,45,617 students in class 10 and 1,03,617 in class 12 appeared for the examination. HP Board SOS 12th (Plus Two) Examinations March 2014 and Class 12 or Senior Secondary exam results are already available at the above mentioned website. The Himachal Pradesh Board of School Education, Dharamshala came into existence in 1969 as per Himachal Pradesh Act No. 14 of 1968. The Education Board prescribes syllabus, courses of instructions and text books for school education in Himachal Pradesh. At present, the Board conducts examination for the following classes and courses: 10th, 10+2, J.B.T and T.T.C. Presently more than 8000 schools are affiliated with the Board. The Board has set up 1650 Examination centres throughout the state. Board also publishes text books for class 1st to 12th.